Bed and breakfasts on Martha’s Vineyard and Nantucket are intimate, home-like establishments, often located in older or historic houses in every nook and cranny of these islands off the coast of Massachusetts. As the B&B name promises, Martha’s Vineyard and Nantucket hotels and bed and breakfasts serve wonderful breakfasts, often with homemade pastries or traditional foods like baked beans, cranberry bread, and maple syrup. B&B luxuries include pleasant sitting rooms, lush gardens, and hosts who can help visitors find all the local historic attractions and places to dine and shop. 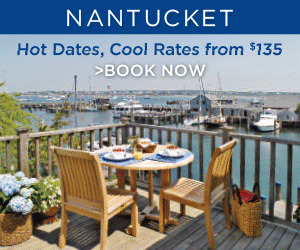 A Martha’s Vineyard or Nantucket vacation place guests close to wonderful beaches, shopping, dining, the Aquinnah Cliffs and gingerbread cottages of Martha’s Vineyard, and whaling history on Nantucket. The proud centerpiece of the Nantucket Historic District, the Jared Coffin House combines its heritage with modern amenities as it welcomes guests to its comfortable accommodations. Built in 1845 by Jared Coffin, a successful ship owner during the island’s whaling days, Nantucket’s first mansion, with its brick walls and slate roof, survived a fire the next year that destroyed a third of the town. 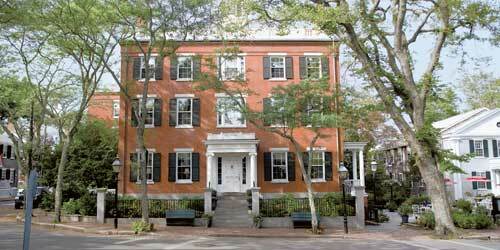 Today, it features 30 rooms in the elegant main building and 13 next door in the Daniel Webster building. Warm but majestic, with furnishings and decor that reflect its proud heritage, the inn offers guests charming rooms, a comfy library, concierge services, gorgeous grounds, complimentary continental breakfasts and a popular upscale steakhouse, Nantucket Prime.